Back To The Future Part II promised us that 2015 would be the year of flying DeLoreans, the Cubs winning the World Series, and hoverboards. Two out of those three still seem as impossible as ever, but we’ve actually seen surprising leaps in hoverboard technology. In fact, hoverboards are quickly becoming so ubiquitous that—like skateboards in the ‘80s—people are being arrested just for riding them around. That’s apparently what happened to Wiz Khalifa last night, at least according to a series of tweets and Instagram posts that the rapper made about how a handful of police officers (or security guards or whatever) “slammed” him to the ground and put handcuffs on him at an airport. As he puts it, this was all because he “didn’t want to ditch the technology everyone will be using the next six months.” Supposedly, the technology he refused to ditch was, in fact, a hoverboard. However you feel about him or this story, that’s pretty rad. It’s so rad, in fact, that we’re going to give Khalifa the benefit of the doubt and assume that he was arrested after getting into a fight with Griff Tannen at the Cafe 80’s. The fight, of course, spilled out into the streets, incited a big hoverboard chase, and ultimately ended with Griff crashing into the Hill Valley Courthouse Mall. 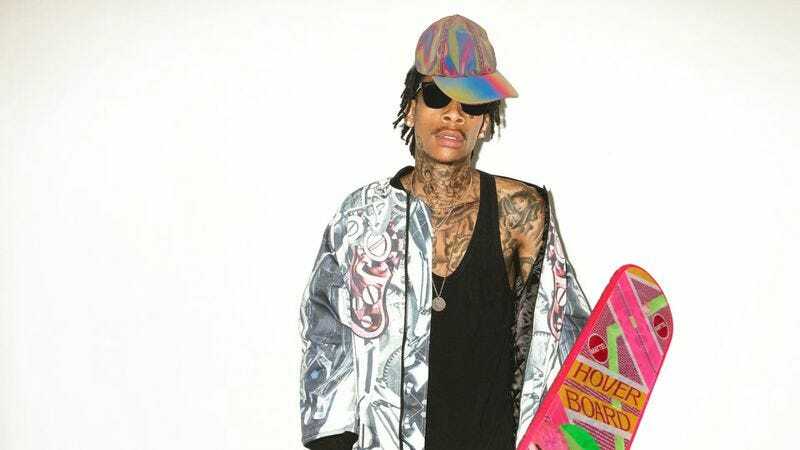 Khalifa then hovered over to a local airport, rode a hoverboard where he wasn’t supposed to, and then he got hassled by some cops. We don’t know if that’s what really happened, but it probably was. Either way, Khalifa seems fine with it.